We may call TV a idiot box but admit that we still love to watch TV whenever we get time. We also love to surf internet most of the time because of our professional and personal needs. What if you can watch TV on your computer and surf internet at the same time? Yes, you got it right, now with a little extension called TV Chrome, you will be able to watch around 2780 Live TV channels in Google Chrome. In short, TV Chrome is the TV Extension for Google Chrome browser that offers you to watch TV directly from Google Chrome Browser for free. There are more than 2780 Live TV Channels that are sorted by country and category and updated regularly. This extension is developed by the same developer which earlier came out with toolbar to watch TV in Firefox browser. In Google Chrome, there is a little icon in front of address bar instead of TV Fox toolbar. First, download the TV Chrome extension from here. After installing the extension, Chrome TV places a icon next to the address bar. 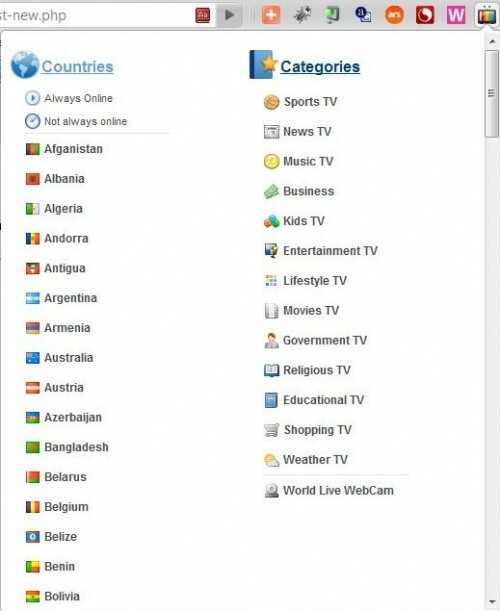 Clicking on it, will open a pop-up window where you can select TV channel to watch by country or category. Click on the channel you like to watch and it will open-up a pop-up window. By double clicking on the media player, you can watch TV in fullscreen mode. I think this is the best way to watch live TV online. But as TV Chrome is completely free so it may happen that any of the channel listed will not work at a given point of time. But more than 2780 channels, I am sure you will surely find the interesting one which will work.